Fans of poker literature will delight in the news that the International Federation of Poker has teamed up with Limehouse Books to create IFP Books, the UK’s only imprint dedicated to poker. 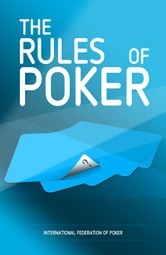 The first title to be published will be The Rules of Poker, in August of this year; the definitive guide to the full spectrum of poker games from Texas hold’em to Omaha, and is edited by the poker playing novelist David Flusfeder, chairman of IFP’s distinguished International Rules Committee. The book will also feature an introduction by the IFP’s President Anthony Holden, renowned biographer and author of the seminal poker memoir Big Deal. “I am thrilled to have forged this alliance between IFP and Bobby Nayyar’s Limehouse Books, and to have found the perfect editor-in-chief in Natalie Galustian, who last year compiled the finest collection of rare poker books in the long history of the game,” said Holden. Plans for IFP Books include producing a volume each year which will aim to combine the authority and global reach of the Federation with the quality and style that are the trademarks of Limehouse, which has grown to publish eight print titles since it’s founding in October 2009. ‘I’ve enjoyed playing poker ever since I read Big Deal several years ago,” said Nayyar of Limehouse. “So now it is a great honour to be working with Anthony Holden and the IFP team to craft dedicated poker titles that will be distributed worldwide in print and digital. Those keen to get hold of what will be an historic book in the history of the IFP will have to wait until August, when The Rules of Poker will be published in hardback, priced at £12.99. Key figures at the IFP World Championships were among those at a lavish ceremony in Paris earlier this week for the 11th Annual European Poker Awards. Now one of the most prestigious events in poker, the awards marks the achievement of players at the tables over the past 12 months, as well as key figures off the tables. Collecting the coveted prize of Player of the Year was Englishman Sam Trickett, a member of the UK Nations Cup team, who had an outstanding 2011. Trickett began his 2011 in form that he would continue throughout the year, posting his first win in the A$100,000 no-limit hold’em event at the Aussie Millions before finishing second in the A$250,000 High Roller event just days later.After reaching the final table of the WPT Diamond Championship in France, Trickett cashed twice in the World Series before returning to France, the South this time, to win the Partouche Poker Tour main event in Cannes. Trickett then reached two further finals, first in the EPT London High Roller event before finishing fourth in the World Series of Poker Europe pot-limit Omaha. In all, Trickett closed the book on 2011 with nearly $4.6 million in prize money. Elsewhere there were awards for World Series of Poker Main Event winner Pius Heinz who collected the gong for Best Tournament Performance, while Andrey Pateychuk was named Rookie of the Year, for his EPT and a WPT titles, won within six weeks of each other. Bertrand “ElkY” Grospellier picked up the Rob Gardner Memorial Award for the Poker Personality of 2011. The Frenchman won two EPT High Roller events in 2011, as well as a World Series bracelet. He also took part in a much hyped kick boxing contest again fellow Team PokerStars Pro Lex Veldhuis (he lost). Away from the tables Jesse May collected the Lifetime Achievement Award. May, known as “The voice of poker,” has commentated on poker for more than a decade, his restrained and hushed enthusiasm familiar as the voice introducing Late Night Poker in the 1990s, the show that turned many people on to the game. May was also in the commentary box at the IFP World Championships. To read about the rest of the winners from the European Poker Awards, go to the Card Player website. 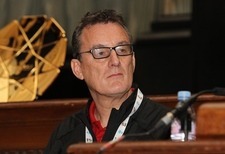 The Nations Cup and the International Federation of Poker was among the subjects discussed by Barny Boatman in an interview with Black Belt Poker this week. Boatman, who captained a talented United Kingdom side in the Duplicate Poker Nations Cup in November, is among the most respected players of the game across the UK and the World and enjoyed something of a renaissance year in 2011. Over the past 12 months Boatman earned more than in any other year since his game turned professional in 1998. Deep runs in four major tournaments, including a fourth place finish at the European Poker Tour main event in San Remo, Italy, gave Boatman a boost going into the new year. “It’s a buzz when y ou’re getting there or thereabouts the whole time, so I played events I wouldn’t normally play simply because I was running well,” said Boatman. What Boatman chalked to “running well”, was more accurately the work of a gifted player, one who has successfully withstood the swings of what can be a volatile game to remain a regular player in the biggest tournaments around the world. It was credentials like this that made him ideal choice to captain the UK Nations Cup side. “I was very fortunate, and very honoured, and actually dumfounded almost, to be invited to be the captain of the UK team for the inaugural Duplicate Poker Nations Cup on the London Eye,” said Boatman, who mustered a selection of some of poker’s leading lights for the team event. The UK side weren’t able to conquer the new Duplicate territory, but Boatman and his players were quick to spot tactical implications of the duplicate game; details that Boatman is keen to explore. “I don’t know what’s going to happen now in terms of my involvement, but certainly the Federation are talking about being involved in the Mind Sports Olympics, and they’re also looking to host another Duplicate Poker Event,” said Boatman. The next 12 months on the IFP calendar certainly will be talked about, with the 2012 Nations Cup and World Championships, as well as the launch of the IFP’s online software, detailed in the coming months; the latter granting players all over the world the chance to compete at the Table. Boatman will likely be among them. Read the full interview with Boatman on the Black Belt Poker website. A pressure group in Northern Ireland looks set to have turned people power into political power, bringing the prospect of a change in the law regarding poker a step closer. Members of Legalise Poker have appealed to the Social Development Committee of the Northern Ireland Assembly to allow both regulated poker clubs and poker tournaments. The move comes five years after poker clubs across the province were closed down. The action, taken in 2006, added Northern Ireland to the long list of regions in which poker, which had previously been played by thousands of people and for many years, was suddenly deemed illegal despite being a game of skill. Happily, this last point was not lost on one representative, Sinn Fein’s Fra McCann, who pointed out that, having watched poker on television it was clearly a game dependent on skill. The Legalise Poker group has pointed out the benefits of a change in the law, which go beyond being great news for Northern Irish poker players. A potential legalisation of poker could create 150 full and part time jobs, according to Glen McCabe of Legalise Poker. McCabe, speaking to the BBC, added that it would also encourage tourism and see the resumption of a cross-community social activity. With so many advantages, not to mention the acknowledgement that poker is not some random game of chance alongside casino games and lotteries, the news looks good for Northern Ireland. You can let us know your thoughts on Facebook and Twitter (@IFPoker). 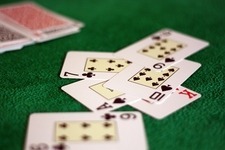 Those looking for further proof that poker is a skill game will find ample evidence this week as the 2012 Aussie Millions gets under way in Melbourne, Australia. Traditionally one of the winter getaways for northern hemisphere players looking for some sunshine, the series, which starts today with the main event beginning on Sunday, has in the past been won by some of thegame’s most complex talents, players who have consistently captured headlines with their results around the globe. None more so than Gus Hansen. Hansen, who was among those taking part in the IFP World Championships last November, and who serves on the IFP Advisory Panel, was already something of a legend prior to winning the Aussie Millions main event back in 2007. Famously ambivalent about his talent, which would at times defy both odds and conventional poker logic, The ‘Great Dane’ has the capacity to make this complex game appear easy; every scrap metal starting hand turned into gold. It all seemed entirely random, until Hansen wrote Every Hand Revealed, an account of his Aussie Millions victory which explained not only why he had taken to playing tournaments equipped with a Dictaphone with which to make notes, but also the thinking behind quite literally every hand played on his way to victory. Hansen explained his thought process regarding his own hand, but also on how he picked up, with almost Holmesian flair, the smallest weaknesses in opponents, enough to quip him with a ruthless advantage to exploit. The book has since become a classic in poker circles. Hansen followed up his win with a World Series of Poker Europe bracelet in 2010. His devil-may-care approach to the game has alwaysbeen obvious – he once claimed to be uninterested in the trinkets of poker success – but the WSOP win served as further proof of Hansen’s prowess and longevity in a constantly evolving game. Hansen is not the only former winner to have turned success in Melbourne into an instructional guide to beating the best (and worst) players in the world. Lee Nelson, who won the event in 2006, went on to write Kill Phil, with the follow up Kill ElkY proving popular as an instructional tome. For those looking to learn how the minds of some of the best players in the game work, Aussie Millions winners seem to be a good place to start. This year’s Aussie Millions will be as hotly contested as those in years past, with hundreds of players expected to arrive at the Crown Casino today as festivities begin. The poker world is sure to get a new champion to laud, and who knows, with ‘luck’ another inside account of what it’s like to be among the best players of this most intricate of Mind Sports.